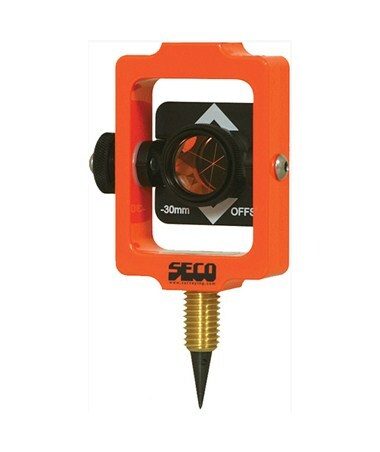 The Seco Stake Out Prism Assembly 6405-01 has a 25mm copper-coated prism that can be set to 0 or -30 millimeter offset settings. It features a pair of vials, one is located at the top and one is located at the bottom. It has a plumb bob point which can be replaced should the point becomes bent or misaligned and is compatible with most plumb bobs. The assembly fits in the included Padded Carrying Case. There are 2 bright colors to choose from: Fluorescent Yellow or Fluorescent Orange. The prism kit comes with a replaceable plumb bob point and a 1 year limited warranty.